Let your Xbox blast some Mars into your lonely face tonight! Tonight, as you're wondering if your level 81 dark elf mage and her sweet double-enchanted dragonscale armor makes up for the girlfriend you lost playing Skyrim, turn your xbox over to the live streaming of the landing of the new Mars rover, Curiosity. Because it's right there on your console's dashboard! It's really a win-win situation. Arborea Darkshadow can wait a few minutes, I'm sure, and you'll either get to witness an action-packed landing of a big new Mars rover, or you'll get to see the hopes and dreams of hundreds of scientists and engineers crash and disintegrate on the cold surface of a dead planet millions of miles away! You know what JGordon will be doing approximately 12 hours from now? Definitely not watching the Curiosity landing! But that's only because I don't have an internet connection at my apartment. No, I'll probably be forcing the cat to participate in the St. Paul Cat Olympics. As far as I know, there will be only one contestant, but it promises to be hilarious! Why? Because she probably can't swim very well. The music is a little over-the-top, but the machine is epic. Even for a girl who isn't particularly interested in space stuff. Tags : Call me 7042424313, Curiosity, engineering, engineering challenges, Jet Propulsion Laboratory, JPL, mars, nasa, no dont call that person call me 9196062468, OMG its sooo scary (not), space, stupid stupid stupid, this is a kids place grow up and take things seriously! This just in: The next Mars landing will be "frickin' awesome"
The Curiosity rover: It's going to look for signs of Mars' past habitability. Also, it's way bigger than the other Mars rovers; about 2,000 pounds, and the size of a compact car.Courtesy NASA JPLWait, who was I quoting in that headline? Me. I was quoting me, from when I described the upcoming Mars rover landing in my head as "pretty frickin' awesome." Or ... that was very nearly what I thought, but the specifics of what goes on in my brain pit are for adult ears only. Which adult? This one. Me. Anyway, NASA's Jet Propulsion Laboratory has produced a video about how the landing of the Mars rover Curiosity will go down, when the spacecraft carrying it reaches the Martian atmosphere on August 4. As you'll see when you watch the video below, there's dramatic music, scientists and engineers speaking dramatically, and dramatic flashing graphics. All very nice and of high production value, but it makes me want to say, "Hey, don't be dorks, dorks. Geez." 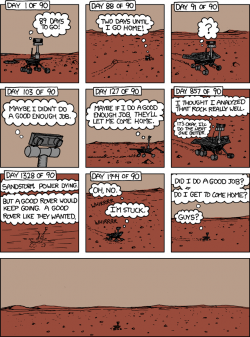 SpiritCourtesy xkcdThe current Mars rovers are, not surprisingly, still on Mars. 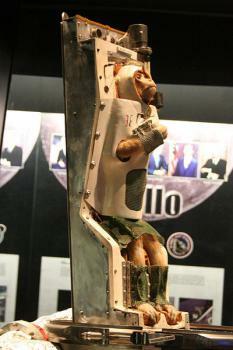 The surprising bit is that one, Opportunity, is still operating, nearly seven years after landing. The other, Spirit, is stuck, possibly in a hibernation mode, and could "wake up" during the Martian summer solstice , this coming March. It’s pretty incredible that these rovers operated so long after they landed – in Opportunity's case 20 times longer and counting. And, orbiting above the rovers is the Odyssey spacecraft, which last week broke the record for longest-working spacecraft at Mars. 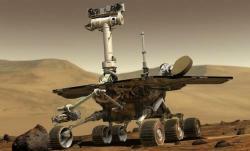 The previous record was set by NASA's Mars Global Surveyor, which orbited Mars from 1997 to 2006. And amidst all this history, a little under a year from now, the Mars Science Laboratory Curiosity will be launched and is scheduled to land in August 2012. 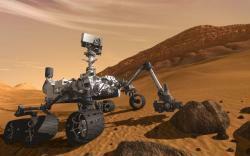 Curiosity is also a rover, but is larger than either Opportunity or Spirit. Its mission is to assess whether Mars ever was, or is still today, an environment able to support microbial life. "Martian Ocean" now one of my favorite phrases. And maybe it's true. Spash! : Martian ocean, Martian ocean. An artist's rendering. Martian ocean.Courtesy lttizJoining my list of most-pleasing words (ala Donny Darko's "cellar door"), which includes such old favorites as "jasper geode" and "top banana," is the phrase "Martian ocean." 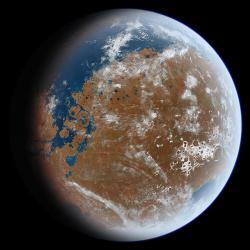 And, as it happens, a Martian ocean may have once been a real thing. Based on the analysis of dozens of the red planet's geographical features, a team of scientists from the University of Colorado at Boulder believe that an ocean may have covered about one-third of Mars' surface, about 3.5 billion years ago. Most of the river delta-like features on Mars, they claim, likely marked the boundaries of the ancient ocean. And although the ocean would have been only about one-tenth the volume of Earth's oceans, the amount of sediment in the deltas suggests that there was once a significant amount of precipitation on Mars, carrying silt through the many river valleys to the ocean. 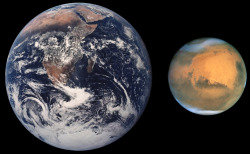 If the theory is true, Mars would have had a water cycle very similar to Earth's, with "precipitation, runoff, cloud formation, and ice and groundwater accumulation." And, most importantly, a Martian ocean. Martian ocean. Maaartiiaaan ooocceeaaan. Martian ocean. Photos of Mars Lander Show Water Droplets...Maybe? 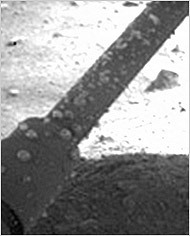 Mysterious material on the landing strut of the Phoenix Mars LanderCourtesy NASA/Jet Propulsion Laboratory-CaltechIn photographs taken by NASA's Phoenix Mars Lander there appear to be droplets of some kind of liquid. Is it water from just below the planet's surface? Some scientists suspect that this is exactly what you see in the photograph here. Although the temperature of the area where the photographs were taken never warmed above -15 degrees Fahrenheit during the spacecraft's mission, scientists think that salts called Perchlorates may have lowered the freezing point of the water, making liquid droplets possible at this temperature. Other scientists disagree, saying that the low-resolution photographs show clumps of frost or may have been formed by heat from the spacecraft's thrusters. This article explains more about the debate. What do you think?